Combine all ingredients in a food processor, and blend. (Told you it was easy.) Leftovers can be stored in a refrigerator for up to two days. Drizzle olive oil in the bottom of pan, add herb blends and chicken. Cook for about five minutes on medium heat, flip and cook other side about three minutes until done. I put the grilled chicken and cooked vegetables on my burger, my husband had a veggie burger, garnished with slices of tomato, red onion and some avocado. 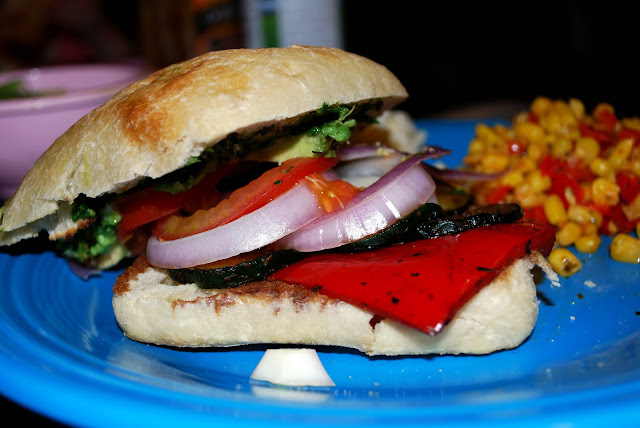 We put them on a ciabatta bun that we drizzled in balsamic vinegar, and then toasted in the same pan we cooked the veggies in. Soooo yummy, and really easy! The veggies I served on the side are also really easy, and something we can get Leila to eat every time! I just combine a can of corn, a diced red bell pepper, the Mediterranean herbs (told you it was a favorite!) and cook it on medium heat for about ten minutes. Congrats on your new beautiful baby girl! Leila is beautiful too..
i am SO making this. looks amazing! Oh I am craving this now! I think we'll be having this for dinner tomorrow night! Thanks! I've been trying to find new things to cook for my family. To help my mom while she's working, so I def. want to try this. Especially because it's healthy.